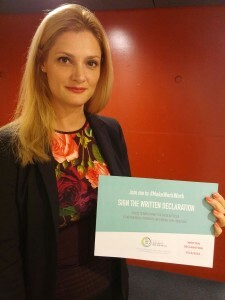 The Call to Action was launched with the support of MEPs Marian Harkin, Jeroen Lenaers, Daciana Octavia Sârbu, Elena Gentile, Jana Žitňanská, Heinz K. Becker, Jean Lambert, Ivo Vajgl, Glenis Willmott, Biljana Borzan , José Blanco López, Bogdan Brunon Wenta, Eva Kaili, Jutta Steinruck , Brian Hayes, Roberta Metsola , Miroslav Mikolášik, Sirpa Pietikäinen, Sofia Ribeiro, Cristian-Silviu Buşoi, Karin Kadenbach, and Merja Kyllönen. 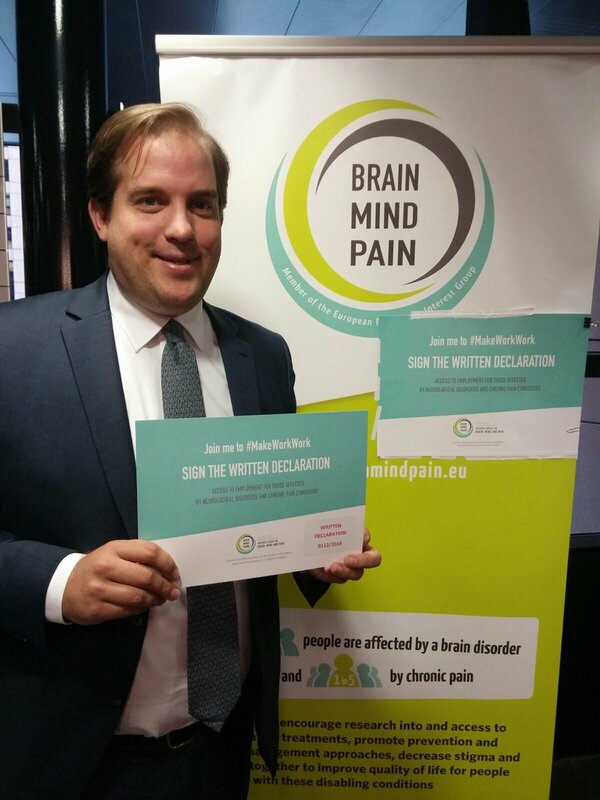 Access to employment for those affected by neurological disorders and chronic pain conditions. Brain disorders and chronic pain conditions are two of the leading causes of long-term sick leave, and are growing in their impact as Europe’s workforce ages. Best practices for the retention and reintegration of people with chronic conditions are widespread. Integrating people with chronic conditions such as these into employment is socio-economically beneficial. The Commission to use the EU Semester’s country-specific recommendations to encourage Member States to implement cost-effective retention, reintegration and rehabilitation actions. 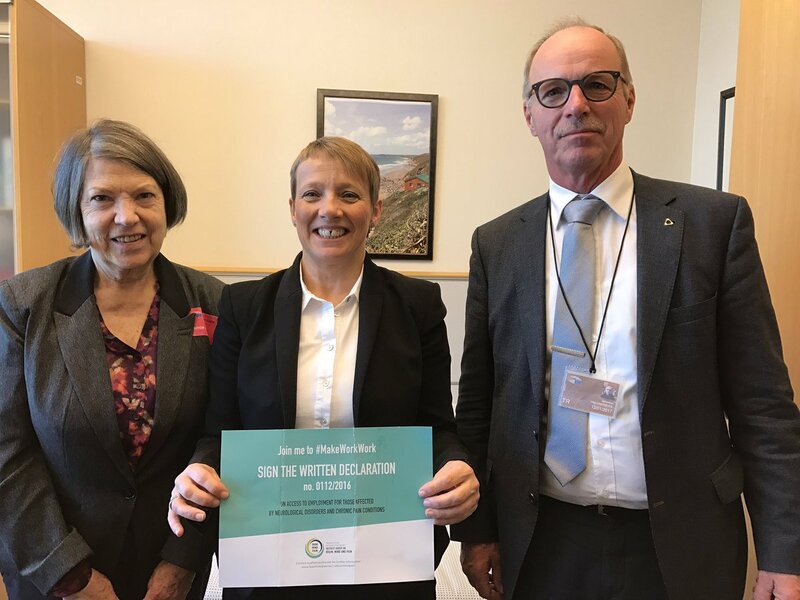 The Commission (DG SANTE, DG EMPL, DG REGIO and DG ECFIN) to collaborate on consolidating and consistently implementing EU legislation that will ensure equal access to employment for those affected by neurological disorders and chronic pain conditions. The Commission in close cooperation with the Member States, to work, together with their social partners, to clarify patients’ rights, highlight successful workplace adjustments and reintegration actions – e.g. flexible working hours – and promote the use of the European Social Fund for such actions. The Commission and Council to encourage the Member States to acknowledge that accurate early diagnosis and appropriate treatment and management are necessary to enable employees affected by these chronic conditions to enjoy equitable employment opportunities. The Call to Action provided many opportunities for working with EFNA and PAE members and developing our very active advocacy role within the European Parliament. We finished the year with almost 180 signatures supporting our call to improve access to employment for those affected by neurological disorders and chronic pain conditions. “My stroke was one of those which happened during the night. One day, being a successful business woman, travelling internationally and responsible for a department of 300 staff – juggling this pressurised work life with two young children at home, and a busy social schedule. The next, facing a 6 week stay in intensive care, 3 months of hospital care, 5 months of rehabilitation hospital, 7 years of ongoing rehabilitation; in total over 12 years to return to an acceptably stable situation. Read Manuela’s story here, and watch the video below to find out more. 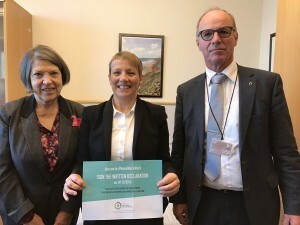 Members of Pain Alliance Europe (PAE) with Clare Moody MEP, centre. (left, Marion Nicholson, PAE and right, Joop Van Griensven, President PAE). View more photographs taken with supporters of the Call to Action here.